A Cylindrical lens is a lens which focuses light which passes through onto a line instead of onto a single point, as a spherical lens would. The curved face or faces of a Cylindrical lens are sections of a cylinder, and focuses the image passing through it onto a line parallel to the intersection of the surface of the lens and a plane tangent to it. The lens compresses the image in the direction perpendicular to this line, and leaves it unaltered in the direction parallel to it (in the tangent plane). 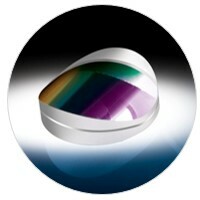 Lenses with cylindrical characteristics can be used to correct ocular astigmatism. A Cylindrical lens is a non- spherical lens, which can effectively reduce the spherical aberration and chromatic aberration, with functions of one-dimensional amplification. Cylindrical lens can be widely used, including: a linear detector lighting, bar code scanning, holographic lighting, optical information processing, computer, laser emission etc., mainly used to change the image size. Shanghai Optics can produce a variety of specifications and different radii, using different glass material (Schott, Ohara, CDGM, Fused Silica, MgF2, CaF2, ZnSe, ZnS etc.). Examples are: Plano-Convex Cylindrical lens, Plano-Concave Cylindrical lens, Bi-Convex Cylindrical lens, Double Concave Cylindrical lens, Meniscus Cylindrical lens. We also can produce special Cylindrical lenses, such as Achromatic Cylindrical lens, Parabolic Mirrors, Cylindrical Ellipsoidal Mirror and double curved Cylindrical lens, such as Aspheric Cylindrical lens and Cylindrical lens group. In addition, we even can produce the requirements of complex shape Cylindrical lenses, such as fan-shaped lenses, the Off-Axis Cylindrical Mirrors, angled Cylindrical Mirrors. Requests can include special Glass materials including ultraviolet and infrared quartz; or crystals like fluorinated calcium. Shanghai Optics has acquired custom made CGH Cylinder Nulls for most F/#’s and apertures for cylindrical lenses testing. Combined with our Zygo interferometer, Shanghai Optics can measure and provide interferogram and inspection reports in the most precise fashion.